Randolph, MA. Former Temple Beth Am. richmond & Goldberg, archs., ca. 1961. Photo: Google Streetscape. Randolph, MA. Former Temple Beth Am. Richmond & Goldberg, archs., ca. 1961. Photo: Beth Am webpage. I was recently contacted by architectural historian Tod Bryant about the former Temple Beth Am, a 1961 synagogue in Randolph, MA, where Tod is inventorying historic resources. 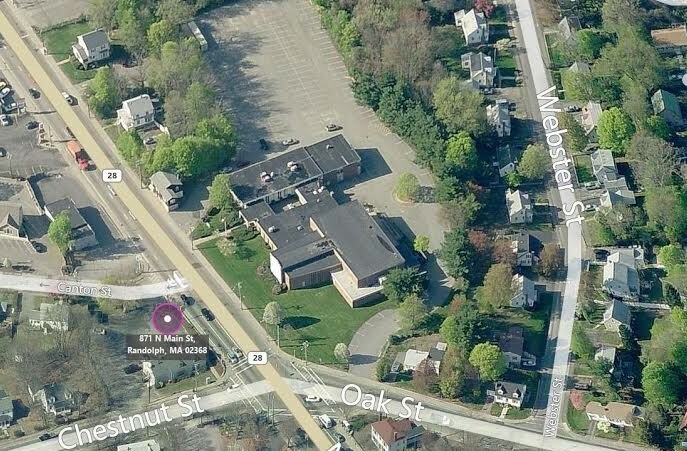 The congregation will soon merge with Temple Beth Abraham in Canton, MA. and the Randolph facility was sold earlier this year to the New Jerusalem Evangelical Baptist Church. 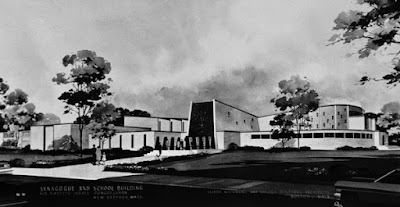 Tod and I pooled our efforts and a little sleuthing determined that this mid-century modern synagogue was designed by architect Carney Goldberg (1907-1981), who with his partner Isador Richmond, designed many mid-century synagogues in Massachusetts. 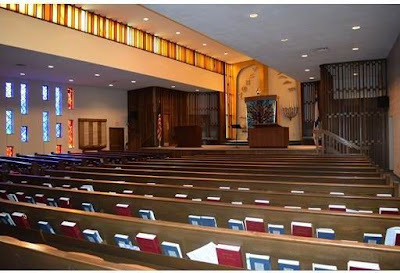 Goldberg appears to have been the lead synagogue designer, but this needs to be confirmed. 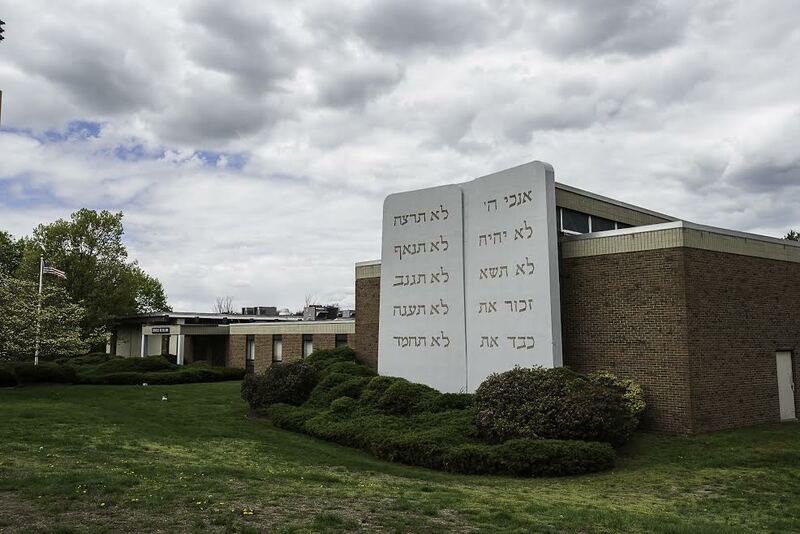 Probably the best known of these is Temple Emeth in South Brookline, which was included in the 1996 chapter by David Kaufman, "Temples in the American Athens: A History of the Synagogues of Boston," in The Jews of Boston. But Tifereth Israel Congregation in New Bedford, MA, which just celebrated its 50th anniversary, is also a distinctive building. New Bedford, MA. 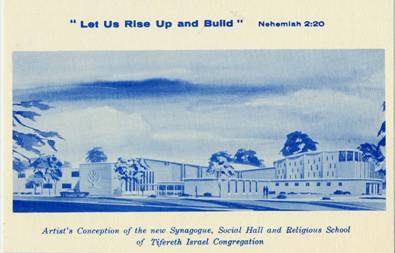 Tifereth Israel Cong., Fund raising postcard ca. 1965. Photo: U. Mass Dartmouth Archives. It appears several of the Richmond & Goldberg designed synagogues have already closed; either sold for reuse or demolished. Steve Kellerman photographed a few of these buildings in the 1980s, but as far as I can tell there is little other documentation of the buildings, or of the lives and work of both these active, successful award-winning Jewish architects. With the limited information easily available it is hard to get a sense of these architect's style, but certain features indicate an affinity with some of the 1950s and early 1960s designs of Percival Goodman and Fritz Nathan. I hope that this notice will inspire some my readers in the Boston area to dig a little deeper, and get out to document all of the buildings by Richmond and Goldberg that still stand, and especially those few synagogues still in use. Randolph, MA. Former Temple Beth Am. From Google Earth. Carney Goldberg (son of Benjamin and Jenny) was born in Chelsea, Massachusetts in 1907. He was probably the son of immigrant Jewish parents - since there were so many Jewish immigrants in Chelsea, then one of the most densely populated Jewish towns in America after New York City. Goldberg attended MIT and graduated with a B.S. in Architecture in 1928 and with an Masters in Architecture in 1929. In 1946 he formed a partnership with the older and better known Isador Richmond; Isador Richmond and Carney Goldberg, Architects and Engineers. Richmond was also born in Chelsea (in 1893), again almost certainly to immigrant Jewish parents (Hyman Richmond and Lena Tanzer). Richmond had also attended MIT in a 2-year special course in architecture from 1913-1915, prior to serving in World War I. He subsequently won the prestigious Roche Traveling Scholarship in 1923 and spent time at the American Academy in Rome. Goldberg was subsequently awarded the Roche scholarship in 1931. Richmond was probably on the review committee. Worcester, MA. 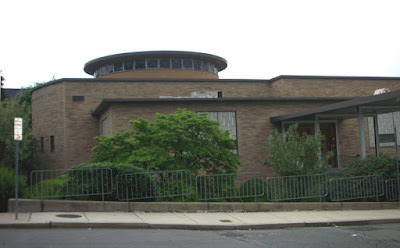 Temple Beth Israel. Carney Goldberg, arch. (1959). Photo: Wikipedia. 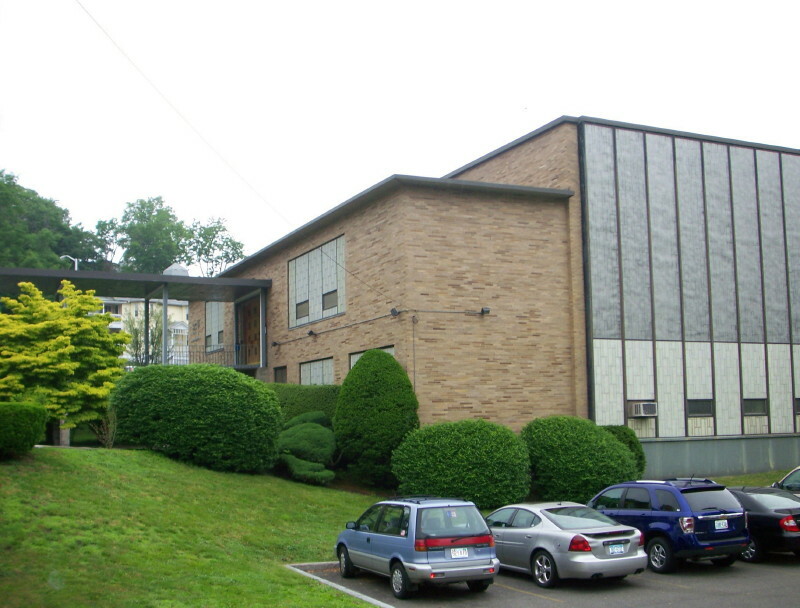 Former Temple Tifereth Israel, 539 Salem St., Malden, MA (1955). Photo: Jonathan Goldblith, courtesy Julian Preisler. Prior to partnering with Goldberg, Isador Richmond had worked at Cram & Ferguson, Bellows & Aldrich, Guy Lowell, and then established and independent practice in 1925. According to his AIA membership documents he was associate architect of the Newtowne Court Housing project, Cambridge, Massachusetts; other buildings designed "include Lamson & Hubbard, Boston; chapel at Isabella Thoburn College, Lucknow, India; industrial buildings for Dennison Manufacturing Company, Framingham; housing projects in Brookline, Mass" and also "college buildings, libraries, temples, synagogues." He also apparently did some teaching at MIT. 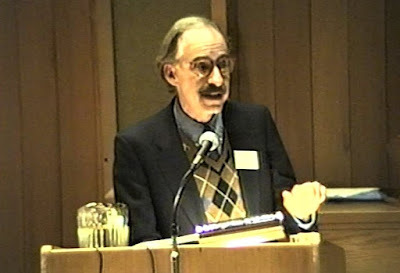 Nicholas (Nikos Stavroulakis at the Future of Jewish Monuments Conference, New York, Nov. 1990 (Photo from video, ISJM). Nikos Stavroulakis at Etz Hayyim Synagogue Re-dedication after Arson. Photo: Etz Hayyim Synagogue, 2010. Today would have been the 85th birthday of Nicholas (Nikos) Stavroulakis, the grand man of Greek Jewish history and culture, who died on May 19, 2017. 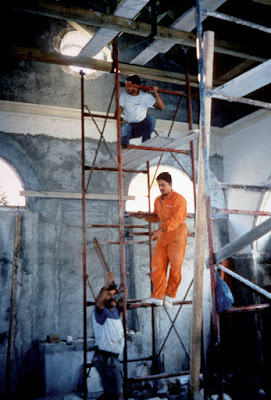 Instead of a birthday party, there is a memorial gathering for Nikos in Hania, Crete, where he made his permanent home for the past quarter century, and where he fulfilled his lifelong dream of restoring and re-animating the derelict Etz Hayyim Synagogue, which had been devastated during the Holocaust and neglected in subsequent decades. Sadly, I cannot be in Crete today, so I write this as the memorial service is getting underway. 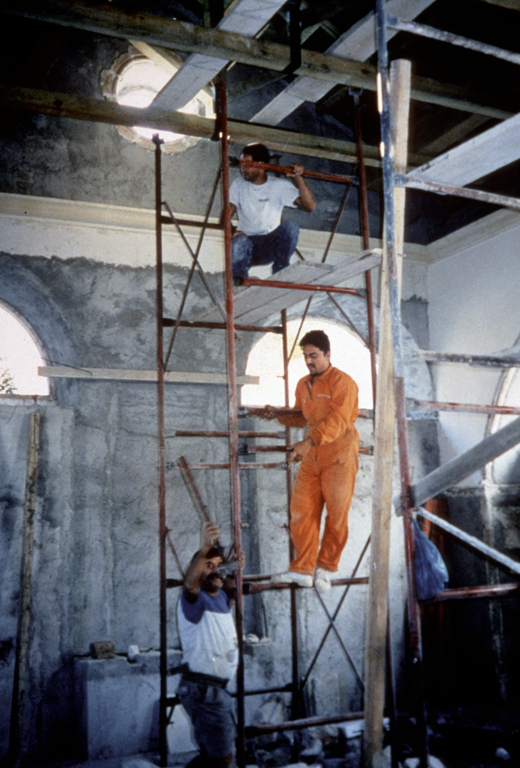 Nikos was a great teacher and inspiration to me, and I was privileged to work with him (mostly by email and telephone) on the Hania synagogue restoration in the 1990s. In truth, despite the success of that project, it did strain our relationship at times as Nikos's passion for the project often outran the paperwork required for the project by the World Monuments Fund. 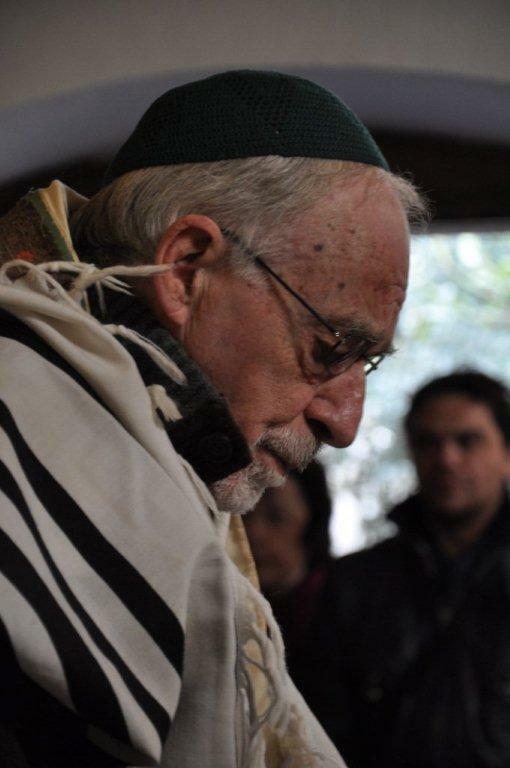 Though I was in direct contact with Nikos only sporadically in the past decade, I was able to follow the growth and success of the Etz Hayyim Synagogue and Center via social media and the internet, and to hear the accounts of visitors to Crete, always delivered with wide-eyed enthusiasm both for the experience and especially for Nikos himself. You can read how he influenced others here. Nikos has a magnetic personality, based on his mix of intellectual brilliance, creative vision, puckish charm, righteous indignation, deep kindness and compassion, and a hypnotically mellifluous voice. I fell under Nikos's spell in the late 1980s when we began to correspond after I assumed the Directorship of the new Jewish Heritage Council of the World Monuments Fund. He was then Director of the Jewish Museum in Athens, which he had helped found in 1977. We finally met in New York when he participated in the Future of Jewish Monuments Conference in New York in November, 1990, and it was then that he began to speak on the international stage about the need to protect and preserve the post-antique synagogue of Greece. As director of the Jewish Museum he and Tim DeVinney had been documenting these far flung buildings, and they published their illustrated history and guidebook Jewish Sites and Synagogues of Greece (Athens: Talos Press, 1992), one of the very first published surveys of Jewish monuments for any country of the world. In this, as in so many things, Nikos was ahead of the curve. Nikos was an iconoclast in many ways. He was an historian of cultural traditional, but he hated bureaucracy and the institutional mindset that things should be done one one because they had always been done that way. He bucked against the formalities and prejudices of cultural gatekeepers - universities, religious orders, and governments. But unlike many brilliant disrupters, Nikos had the imagination and tenacity to create new communities and structures to replace those he found lacking. His own career was nomadic and erratic and yet it did lead - seemingly inevitably - to his work and leadership in Hania which brought together so many threads of his intellectual, creative, spiritual and social self. He was a leader and a trend sender. There was something of the prophet in Nikos. One can see him in the images he made of Jeremiah when he illustrated that Bible book with woodcuts, published in 1973. Before Etz Hayyim, Nikos was a founder and leader of museums in Athens and Thessaloniki. All these efforts become models for efforts by others in other countries. Nikos was also was a talented artist (see his woodcuts that illustrate the Book of Jeremiah), and he was reputed to be a great cook, and he wrote a cookbook. Nikos was one a handful of first generation pioneers who took on the task to document, remember, protect and present the heritage of Jewish places and communities in the decades after the Holocaust. Because he worked in Greece, he was not as widely known as some of his Eastern European colleagues. And because he also colored outside the lines, working across national, ethnic and religious boundaries he was not always embraced as closely as others by the mainstream Jewish community - in Greece or in America. But it his his example of active love and truth-seeking curiosity that the world and world religious need today more than ever. Nikos will be missed terribly by the thousands he knew and inspired - even during short often short interactions.